Welcome to Morgen’s Poetry Writing Group and the fourth poem on this blog. This piece is a pantoum by multi-genre author Salvatore Buttaci. Please do comment in the section below telling us what you liked about this poem and, what if anything, the author could do to improve upon it. Thank you, it’s very much appreciated. “See how men tremble in our wake. Look how our powers cause such wonder! They hear and see us and they shake. Nature’s joint fury curdles blood. one streak of lightning said to thunder. Thank you, Salvatore. I’ve only ever written one pantoum (a non-rhyming called ‘Writing a Pantoum’ – maybe I should put that up here!) and find the repetition so effective. U. S. A. Today, The Writer, Writer’s Digest, Cats Magazine, The National Enquirer, Christian Science Monitor, Poetic Bloomings, and A Word with You Press. 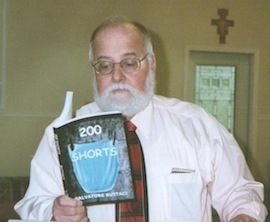 He was an English instructor at a local community college and middle-school teacher in New Jersey before he retired in 2007 to commit himself to full-time writing. He lives with his wife Sharon in West Virginia, USA.